Helichrysum, or straw flowers, are part of a flower group known as "everlasting flowers." The flowers in this group, which retain their color after drying, have been used for centuries in flower arrangements that last for years. Yellow, orange, red, pink, burgundy, white or purple can be found in straw flowers and, like all everlasting flowers, the colors will remain vivid after drying. Straw flowers are easy to grow and dry. Select straw flowers to be dried before the yellow center of the flower opens and is visible. As the straw flower begins to dry, it will continue to open. Picking your straw flowers before they are completely open means moisture is still in the petals and the flowers are easier to handle. 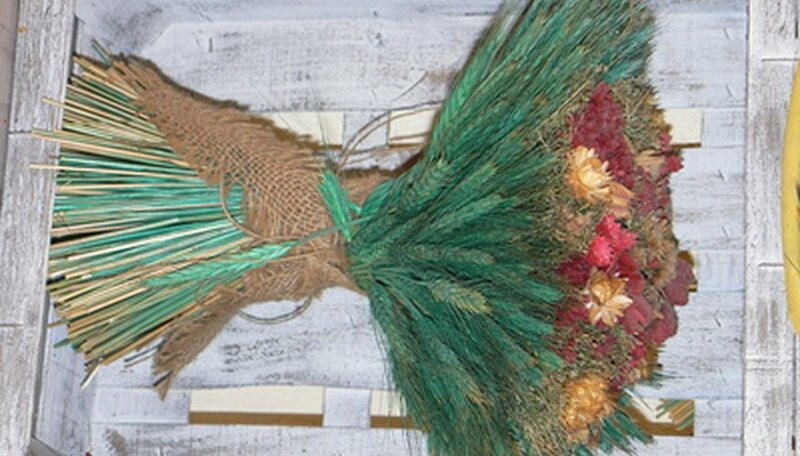 Cut the selected straw flower so 10 to 12 inches of stem remain on each flower head. Trim and remove any leaves on the stem. Wrap or bind a cluster of stems together with a rubber band tightly wrapped as the stems will shrink as they dry. It is better to band together small clusters of no more than a dozen flower heads at one time to improve air circulation and flower shape. The rubber band should be wrapped a few inches from the end of the stem. Hang the rubber band clusters upside down in a cool, dry and shaded or dark place that receives good air circulation. Your straw flowers should be dried and ready to use in two to three weeks. Select straw flowers that have not completely opened and the center yellow area is not visible. The best time is after only the first two or three outer rows of petals have opened. The straw flower will continue to open as it dries. Cut the flower head off the stem, leaving little or no stem attached to the flower. Insert a length of .22-gauge wire into the base of the straw flower blossom, where the stem was attached. Insert the wire far enough so the flower head is secure, but not so far that the wire pokes through the entire flower. A length of 6 to 10 inches usually is sufficient. Stick the wire end into a styrofoam block so the straw flower head remains upright. You can stick as many wired straw flower blossoms into the styrofoam as the block can hold. Place the styrofoam block with the wired straw flowers in a place that is dry, dark, cool and has good air circulation. Your straw flowers should be dry in about two to three weeks.